← The Feeder Feed: Am I blue? I would like to know what the appropriate academic dress is for priests at a graduation ceremony. I understand that the current "secular" dress evolved from clerical dress in the first place, namely the cassock and biretta. Would it be appropriate then for a priest to wear a cassock, with a master’s hood, and biretta? I know there is a four cornered biretta for the doctoral level, but what about for a master’s degree, or STL? Is there a three cornered biretta with red piping for theology? If I wear a traditional "graduation gown" over my suit/cassock, should I wear a biretta instead of the traditional mortar board? Thanks for your help. Some of this will depend on where you are. Academic dress in Rome is different from academic dress in, say, England. The USA generally follows the English customs. My understanding is that the secular/diocesan priest dresses in a house cassock appropriate to his dignity and ferraiolo with biretta. If he is holds a doctorate from a pontifical university, his four-cornered biretta is trimmed with the color of his field (theology-red, philosophy-blue, law-green). It is also possible to have a doctoral ring from Roman institutions, engraved with "Roma". To my knowledge there is no special attire for the Master’s or STL, though I have heard in some places of the three cornered biretta fo the STL on the model of the doctoral biretta. You would use the house cassock, biretta, and ferraiolo. Depending on the tradition of the school, I suppose he could wear the doctoral robes of the institution with the academic hood. But that seems more like an English Anglican custom. Priests often don’t know what to wear for formal occasions, such as black-tie or white-tie events. The proper house cassock and ferraiolo should be used rather than just the plain black suit. Thanks for this information. I always wondered about this. The only clerics I have ever seen in cassock, birretta, and ferraiolo in attendance at graduations are bishops and monsignori who were not part of the faculty. Priests who were members of the faculty wore secular academic regalia over a cassock or shirt with a Roman collar, sisters wore their academic hoods over their habits, and the religious brothers wore secular academic regalia over their religious habits. I have absolutely no idea if this is appropriate, but here at Univ of St. Thomas (MN) I’ve seen a priest in academic regalia (robe + hood) but with a biretta in place of the academic cap / tam. Other priests just wore academic regalia with no outward sign that they were priests. My question is where one can find a black ferraiolo nowadays? All I’ve been able to find are ones for monsignori and cardinals. I was told by a fellow friar some years ago that the Capuchin tradition was not to wear any academic regalia over the habit as no earthly honour could equal that of serving God. Another told me that while studying at Berkeley, California, there was big pressure not to wear the habit (anachronistic, meaningless etc.) but he was amazed to find the same people decking themselves out in academic regalia. “English Anglican” (seems almost a tautology) custom would indeed be cassock with the appropriate gown and hood (also the tippet, but that garment seems to be unknown to contemporary RCs). The mortar board and biretta have a common ancestor somewhere in the middle ages, so you could probably take your pick. In England, at least, some doctorates come with their own hat (e.g. ) which might be taken to supersede both. Br. Tom Forde OFM Cap: Yes, I do recall the Franciscans’ never wearing any academic regalia and simply processing in their habits, but the Christian Brothers definitely did (and some still do) wear it over their robe and rabat. And yes, I also find it ironic when I see men and women religious who eschew the habit but make quite a to do about their academic regalia and proudly parade around in it at graduations. One can hardly get more Catholic than the Catholic University of Lublin in Poland. Rectors and deans of colleges wore their appropriate robes of rank…in other words, the only way to tell whether one was a clergyman was whether a collaro or habit hood was sticking out on top. The only degree holders with robes in a traditional Polish university are those with doctorates and doctors with “habilitation”. Theirs robes are generally more simply cut, but heavier (velvet) than our English-derived robes and their caps resemble a heavier Canterbury cap. I have seen bishops in attendance at academic functions wearing their everyday black cassocks with colored piping…but this was all under Commuism, so perhaps their style was more no-frills then. Polish academic dress began as a sort of patriotic revival since many academics didn’t want to don Austrian civil service uniforms when the Emperor visited. What would be “black tie” or “white tie” events? I would not know if I was invited to one or not, as my chances for such invitations are probably nil out here in the rural countryside. One can still find a ferraiolo at the House of Hansen ecclesiastical tailors in Chicago. You can find their site online. I recall that in the seminary in St. Louis for formal commencement exercises, priests dressed in their cassocks or attire from their universities. Several schools in Rome have clerical academic dress to go on top of cassocks. (E.g., the Alphonsianum) As for the ferraiolo, this was rarely seen, though a brave transitional deacon did once wear it. I consider one of the benefits of the priesthood that I never have to wear a suit to a formal event ever again. Nor will I ever have to wear a silly hat that barely sits on my head at academic functions. This is yet another reason for cassocks, birettas and the ferraiolo. Clerical suit or Cassock, gown & hood is the general rule here in Ireland – only Trinity College Dublin specifically mandates this however. The only Pontifical University in Ireland is at St Patrick’s College, Maynooth where the cassock is sadly unknown. However, STB/BD, STL & STD/DD garb are all worn at degree ceremonies. The Dominican friars taking degrees there follow the custom mentioned by Br Tom Forde above and wear their habits & cappas in place of academic gowns. Dominicans taking their degrees in the secular National University of Ireland, Maynooth also shun the gown for the habit – with no adverse comment as yet! I possess a JCL. On academic occasions I wear my academic biretta: three points (to distinguish it from the JCD) trimmed in red with a red pom-pom, purchased in Rome. In our graduation procession, all JCL recipients were simlarly attired, and we tipped our biretta to the University president (a JCD holder) as we passed by. What of an STB Holder or candidate (at the commencement)? Moot point for the most part since seminarians don’t typically attend their graduate commencement (to my knowledge. I presume they are too busy getting ordained), but still. He does not have a Licence, so a biretta trimmed in red is probably not appropriate. Is it just as the above, IE Cassock, ferraiolo, and/or hood, but with a plain black biretta rather than a trimmed one? 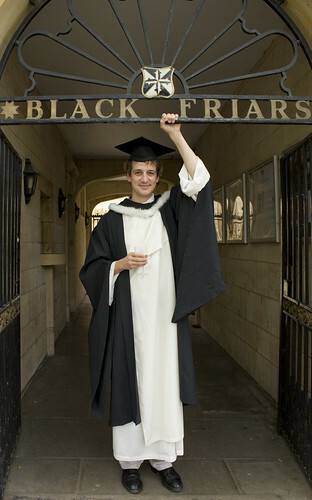 Dominicans in the U.S. generally wear the academic hood over the black cappa and white habit. That would be the equivalent of cassock and feraiolo — i.e., fancy street wear. Those with a ecclesiastical degree often wear the biretta (if they have one): 3-corners for the license or equivalent, four for the doctorate (or the honorary S.T.M., which also has a ring). Those with only a “secular title” (e.g. a G.T.U. degree) do not usually wear mortarboards but I think that is more because they don’t have one or because it is a “bother.” But some do wear the motarboard. Before I got the S.T.M., I wore my Univ. of Calif. black velvet mortarboard with gold tassel. Several years ago my husband and I were invited to a formal event honoring a retired bishop. Our parish had a table at this event, and our pastor wore a cassock and black ferraiolo. I had never seen one before on a priest, but it was very impressive. I won’t mention the pastor’s name because he posts on this blog, and is very modest. At least traditionally, “white tie” attire was “formal” and “black tie” was “semi-formal,” the appropriate dress code being mentioned on the event invitation. These days you pretty much have to be at a diplomatic function of the highest formality to go white tie and most people regard “black tie” as formal. At least in theory lots of events, such as weddings, are at least semi-formal/black tie by default. I find the whole topic thoroughly interesting. A related question is what to do with one’s doctoral tam while attending Mass in academic garb. I’ve been told the instructions will be in the Mass program for our graduation, although I think I get the general idea: take the tam off for the gospel and the Eucharistic prayer. We do still see an occasional white tie affair here. A big evening wedding, for example, or the hospital benefit ball. But this IS the South, where everybody enjoys putting on the dog. The really good news for us is that a kilt with a Prince Charlie coatee and lace jabot or white bow tie with boiled shirt is the equivalent of white tie (we are of Highland descent and cheap, cheap, cheap). And our friendly Armenian tailor was happy to cut a retired tailcoat from the local tux rental joint into a perfect copy of a Prince Charlie (he tsk’d tsk’d and chuckled a lot though). Our rector wears his cassock just about everywhere, but I have not yet spotted him in a ferraiolo. But that may just be because I wasn’t looking in the right direction at the time . . . .
Far be it from me to suggest a new tradition, but I recall reading a regulation allowing military officers in uniform to carry their robes and presumably hoods over their left shoulder. Maybe it was over the left arm. I can’t find the reference right now. By the way, I like the Anglican tradition of wearing the academic hood along with choir robe and surplice for evensong and morning prayer. When I’m singing for such occasions, I get special pleasure out of displaying the papal colors of my own institution. Does anyone know if this wearing of the hood is ever practiced in Catholic churches in Britain? You appear to have made a mistake with regard to the colors of Theology and Philosophy. Br. Tom: That’s how I was taught as well by the Capuchins here in the States. So when I took my licentiate, I had just my habit, with the academic hood over my arm. I don’t know about the academic biretta, birettas being forbidden to us. Appears to be a Dominican (at their House in Oxford), wearing an Oxford BA gown and hood (and mortar board) over his habit. is that right? I thought THEO was red, and PHIL blue? I’m currently looking for a place to get my masters in theology. In my searching I found this newsletter from Catholic Distance University: http://www.cdu.edu/documents/alumni/pdf/NetNewsQuark-Winter2009.pdf. There’s a picture of graduates on page three. A deacon who got his masters is wearing a dalmatic over his robes. Is this standard? Would a priest wear a chasuble? And I know this is off topic (Father Z, feel free to squash this tangent), but does anybody know any good schools to get a Masters in Theology online? I’m in the military so being a traditional grad student isn’t an option. Dr. Peters: Thanks! I scrambled them in my haste. I’ll correct the top entry. Dr Peters, you are right. Some of my Confreres at CUA have had their PHL birettas sitting on their desks for months. Philosophy is blue. Theology is red. I have not seen a JCL/D hat, But I will trust it is greenly piped. Following up on the Anglican parallel, Percy Dearmer argued that, according to both pre- and post-Reformation canons and episcopal rulings, the proper “street dress” of a Church of England priest was cassock, gown, tippet (i.e. long black scarf) and square cap. If a degree-holder, the gown of his degree; if not, the “balloon-sleeved” gown of a simple priest. The whole ensemble may be seen here. At an academic event, all that would be further required would be the hood of any degree (although he seems to argue for this as street dress too — a bit of a stretch), plus (if it was a doctorate), the “scarlet” version of the gown. Incidentally, Anglican clergy of today, like their medieval forebears, still wear their academic hoods as part of choir dress (cassock, surplice, hood, tippet), as may be seen here. Sadly, today’s clergy seem content with squalid polyester bastardizations of the beautiful old garments. I think the colorscheme mentioned above is in use at pontifical universities. Other institutes have different customs, especially internationally. For example, the color scheme in use at my university (in the Netherlands) resembles in no way the one mentioned in your link. Right Ihatch, Fr. Z is talking pontifical. I wear purple doctoral sleeves for my degree in civil law, but pontifical colors for my degree in canon law. ps: bit-o-trivia here: for some years, the canon law program at CUA was absorbed into the School of THEO there, so some us grads from that period actually wear red, tho by rights (rites?) we should wear green for canon law. This does raise an interesting question. There does seem to be some ambiguity on this. Some say that the shoulder cape is a sign of office, others say that it is open even to seminarians and some say that it is limited in its use only to prelates. It seems difficult to find any explicit legislation on this matter. Thoughts? I have seen Benedictines in solemn vows wear their academic hood with their cuculla and a biretta. I have also seen priests wear a Roman collar and pants under their standard academic regalia. 1) One person mentioned a standard 3-horned biretta with academic colored piping and pompon for a priest with a master’s or STL. I can only find mention of the 4-horned doctoral biretta. Would it be correct to wear a 3-horned biretta with red piping and pompn for MDiv/STL? 2) Is it appropriate to wear the academic hood over a cassock or should a standard academic gown be worn if the hood is worn? What about over the fefraiolo? Would it be correct to wear a 3-horned biretta with red piping and pompn for MDiv/STL? MDiv is not a pontifical degree. Sorry, I was implying having an MDiv AND an STL.